Neha Juneja and Ankit Mathur run Greenway Grameen Infra. They've recently designed Greenway Smart Stove, a single burner stove designed as a low cost replacement for traditional mud chulhas, which pose grave health and environmental hazards. Through their company, they are aiming to provide similar such innovative and holistic solutions for rural consumers in India. Juneja and Mathur tell us just why they ditched the idea of thick pay packages to follow their dreams. Among the things they've been called in media reports, 'Prometheus of the poor' was what struck me the most. 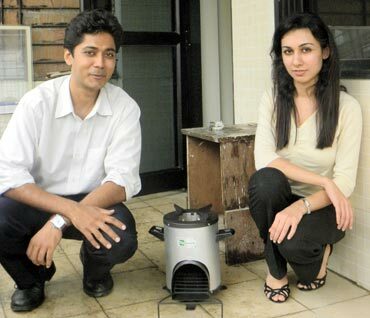 Mumbai-based Juneja and Mathur run Greenway Grameen Infra and have invented a single burner high-efficiency cooking stove. 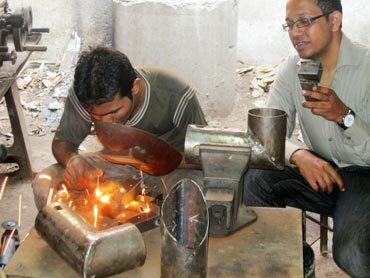 The stove has been designed as a low-cost replacement for traditional mud chulhas, a popular mode of cooking in rural India and is said to save up to 70 per cent fuel and minimise harmful emissions. Greenway Grameen Infra is a firm that is aiming 'to create and satisfy rural markets and infrastructure needs in a sustainable manner and provide innovative and holistic solutions'. In other words, the idea is to identify the various needs of rural India and create products keeping only them in mind. Neha Juneja (26) and Ankit Mathur (27) spoke with rediff.com about what it took to bring out a product in a niche sector and just why they ditched the idea of thick pay packages to follow their dreams. Could you tell us something about your company? Neha: It's a straight out-of-college start-up that we are hoping will make a better impact on the society. We started out by taking up consulting assignments on natural resource management, carbon finance and carbon credits projects etc. but now are largely focussing on (producing products for) the rural markets. There are very few companies that work in this sector and given our exposure to rural lifestyle (coupled with) our understanding of how community interacts, we (saw the need) to co-create products for rural consumers. What do you mean by co-creation? Neha: Rather than prototyping (a product in a laboratory) we prototype it with the people (who will eventually use it). 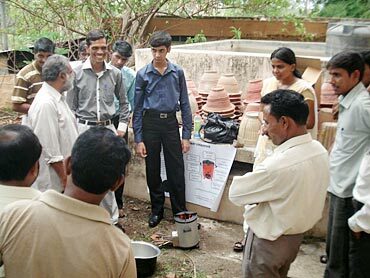 We built prototypes (of the stove) so people could keep suggesting changes and redeveloping the product designs. 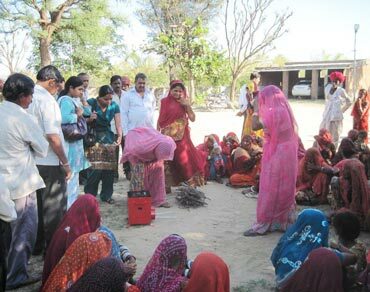 The prototypes of the stove would be taken to various villages and women would be invited to use it. We never asked questions about what they liked in the stove or not but rather simply let people come up with suggestions and found that they (the womenfolk especially) had some brilliant suggestions to offer. Soon we realised that the issues were not technology related but rather simple design challenges. Interacting with them helped us not just in capturing design inputs but also in other things like price points etc and gave us great consumer knowledge. Today (when the final product is ready) adoption is not an issue at all. No one says it should have been taller or shorter. Sure there are people who still have suggestions to offer but adoption, which is an issue in rural products, has not been a problem in our case. Why did you decide to get into the environment sector? Ankit: Honestly, when we graduated we had a broad idea of a few things. I joined my uncle who had just started out a marine services company but soon realised I couldn't handle it. Then, for a brief while, we ran CFA (Chartered Financial Analyst) classes and even built a website for dealing in derivatives for retail investors. Sadly none of them worked out. Then we decided to get into environment as a domain. By October 2008 -- five months after we graduated from our B-schools and burnt our hands with these start-up ideas -- we had started consultancy on bio-diversity projects, carbon foot printing, and carbon credits (among other things). We had lots of projects in rural areas (and realised) that lack of access is a bigger issue than the so-called 'smart ideas' about biomass plants or solar panels or sanitation projects that cost Rs 50 crore. To have a higher impact you need to have the right products at the place where people will be willing to buy it. The classic example of this is the mobile phones. There is no subsidy on mobile phones but it is has become popular simply because of the convenience it offers. Okay but why a stove? Neha: In India over 70 per cent of the population still uses (various types of) stove. Till the mid-90s you the mud stove, kerosene stoves and the LPG stoves. Today the kerosene option is out because of (correct) policy (decisions) and the gap between the mud stove and LPG stove has grown wider than ever. LPG penetration in rural India is just about 15 per cent. And if you compare the rise in rural income vs the LPG prices and the GDP growth and the LPG prices, LPG is becoming a non-viable option. The market size of households using stoves is over 150 million in India and 3 billion worldwide. Half the world's population relies on a stove. Further (because of our engineering projects) we understand product material etc and experience tells us that it is not difficult to have the right product (in the rural market). Rural products need not be cheap and substandard. People ask (us) why would anyone want to pay for a stove when a chulha is for free? The fact is that rural does not mean poor. There is money in the villages and (like everyone else) people in the villages have aspirations and spending power too. There may not be as much a consumerist attitude as there is in the cities and (it is true that) rural consumers are cautious buyers but they all want to have better lifestyle in whatever form. When we started out (we realised that) a lot of times the lack of a good product enhances (sic) poverty. For instance, a kerosene lamp always has a recurring cost. Besides (users) always pay with their health because of the fumes. (The same holds true with a mud stove where there is a recurring cost of coal, loss of time, adverse impact on health and of course productivity). So a good product design is something isn't just utilitarian but also gets a lot of problems solved. What would you say your learnings have been so far? Ankit: Don't be afraid of experimenting: Besides experimenting, it is important to experiment fast. If you fail you must cut your losses and move on. Don't hesitate to ask: The other learning has been that we shouldn't be afraid of asking for advice. A lot of us tend to hesitate to reach out to people and ask for help and hope to figure it out on our own. Don't take s***t from seniors: Because of our age, lot of people look at us and don't take us seriously -- be it a prospective customer or a distributor. We had to learn to stick to our guns. Convincing the family is important: In our case it gave them confidence that we were doing something fruitful. It's always good to have your family on your side so you can reach out to them if nothing else, for a meal. Raise capital first: We were cross-subsidising the stove with the money we made with our consultancy. So we never really figured out how much we spent on the project. What would you say were the challenges you faced? Ankit: No business school teaches you how to set up a company. They will tell you all about the strategic stuff but not the procedural details like how to get a VAT/service tax registration or what is the minimum number of directors you should have on the board. These were things we had to learn the hard way. (Neha chips in): I didn't know for instance that a woman cannot sign on a VAT/service tax registration form because according to the law, you cannot arrest a woman after 6pm if she is accused in an economic offence. If a woman signs the form, chances are the papers will be rejected. Doing business in multiple states in India is like doing business in multiple countries. There are different rules about shipping a product in or out of a city (let alone a state). The quantum of payment is not so much of an issue as much as the management of the various registrations that is a hassle. Then of course a lot of brands and people took us for granted. We would be told that we should pay them for letting us do the work we do. Finally, there were investment challenges. We were focussing on consulting assignment and this was more side business. If we had got out of it (consulting business) earlier, we would have been able to produce the stove faster. It's been a month since we've gone into production. How many pieces have you sold so far? About 3,500 in the last one month but we're hoping to sell about 8,000 units per month. How has the feedback been -- from the users and the distributors? 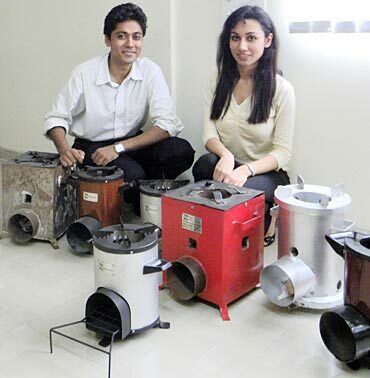 Neha/Ankit: We had started selling from the prototype stage itself. (It helped us understand user psyche and decide on the price point). The feedback from the users has been positive with many of our users asking for more pieces from us so they could sell it to others. As far as the market is concerned, the margins to the distributor are not as handsome as you might expect. So we've been offering to organise marketing camps, demos and reduce cost if they order beyond a certain number. Both of you come from reputed management schools (Neha comes from Faculty of Management Studies in New Delhi and Ankit is an IIM-A product). Did the thought of a high-paying job never entice you? Ankit: I had opted out of the placement (season) because I felt that at the end of the day I would be a cog in the wheel. To have something of your own gives you a high like no other. 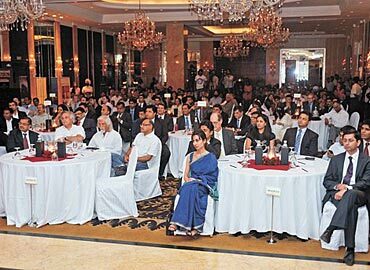 Perhaps we have lost out on Rs 10-20 lakh in salaries but the insight we've gained in the sector (we work in) is amazing. Neha: The other thing about graduating out of reputed educational institutions is that you always have a safety net. Should things go bad you always have your degree that can get you a job. When you see your friends earning high salaries, does it not cross your mind that perhaps, just perhaps you should have taken up that offer? Neha/Ankit: After the initial excitement of their new months (and salaries), a lot of our friends are now bored. We are certainly not as rich as some of our friends but unlike them we are not bored. We believe hardships and challenges are fine but boredom isn't. So what are the immediate plans? First we need to establish a credible distribution network. Despite the general opinion that distribution adds to the costs we believe that it in fact helps save on logistics because there is a focal point to do market activation and (organise) regular supply to those areas. Meanwhile we have a second product that is under development for which we have been given a grant by the Swedish International Development Agency under their innovations against poverty programme. The agency is subsidising a part of the project. There have been enquiries from Bangladesh because floods often destroy the stoves and there is a need for portable stoves. Besides Bangladesh there also have been queries from Africa but we don't yet have an export-import license. What are the things that young entrepreneurs must keep in mind? Learn fast; better still, learn from others. It is always better to plan out everything -- even in terms of the roles each partner would play in the organisation. Finally, stay motivated and be disciplined.